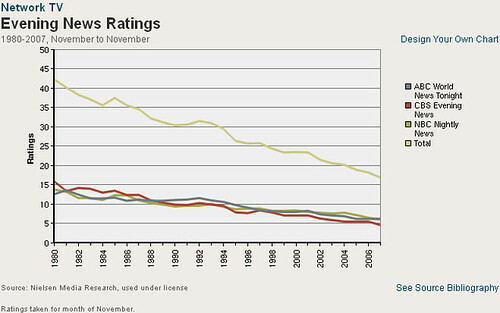 Nielsen Media Research has an amazing chart showing the plummeting ratings for the evening news viewership. This won't come as a surprise to many of us, but fewer and fewer people are watching the Network News. I'm guessing the DVR effect isn't helping either as those who might even record the news and watch it later just skim through it. Unlike some in my age group, I used to watch network news but now pick it up rarely. Any more I get my news from newspapers (yes the paper kind), internet sources, cable news and radio. Newspaper readership continues to drop by over 2% per year while News Magazine readership continues to fall as well. The outlets that seem to be increasing in viewers/readers are Cable News and Internet. I'm guessing that every news outlet has dropped in viewership/readership over the past ten years except for internet sources. I just hope they are picking the newsier internet sources.